We docked in Helsinki, Finland on July 8th, 2010. 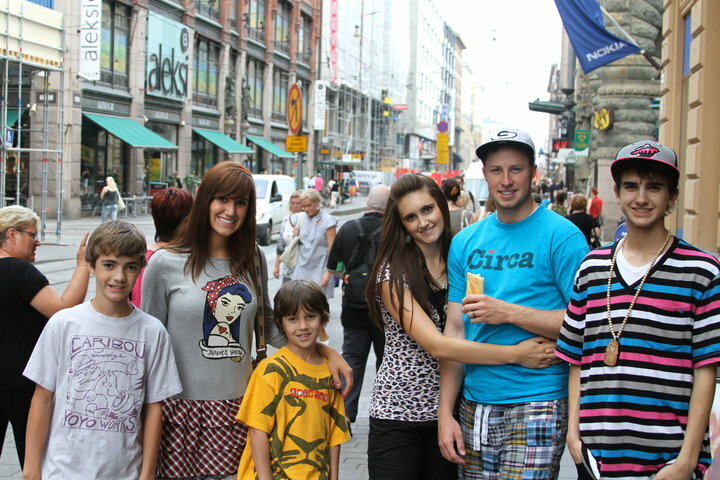 This day was very fun even though we didn't have as much time to go look around the city! The crazy thing about Scandinavia is that it doesn't get dark at night until like 2 in the morning so it is hard to sleep with the sun coming in the rooms so we were experiencing this for the past few days! Quick picture as we exited the ship! We went into a Finnish grocery store and it was sure a sweet store. Not only did they have chocolate (behind us in the picture) but they had like 5 other levels...including a Ralph Lauren Polo section, jewelry, grocery store, pharmacy, coffee shop, shoe sections, makeup, basically everything you need. Kind of crazy! 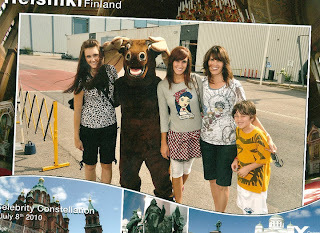 We were exploring when we came across the <3 Helsinki on the side of a building made out of trash! Pretty cool though! Some amazing building we saw! Actually I think it is a church. Kevin is obsessed with this building! Oh Kevin loves everything Italian! Here is a little restaurant! Incase you didn't know my brother Zach is a sponsored yo-yoer and so we had him yo-yo in all of the countries and sometimes he made money! He can make pretty good money yo-yoing, not kidding, I think he should do it more often! He is actually just getting back from Worlds Yo-Yo Competition in Orlando. He placed 2nd in the world his age, 8th in the US, and 29th in the world overall. He is legit. Youtube him. Here is a couple watching him. By the way, EVERYONE in Europe has these baby strollers...bassinet style! I think they are fun and more stylish than the American ones...but the American ones are probably easier to steer, swivel around, and fold down to put in your car. 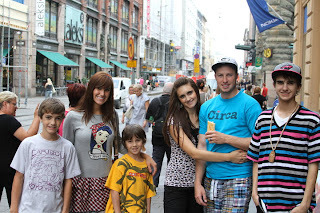 We did do a little shopping in Finland, Hallelujah! We went into H&M and I got this black and white cardigan with crazy arms. I tried on a few other things and I was going to give them back to the girl who worked in the dressing rooms and she said "Go get your number", meaning the number of items you have in the room, which US companies do sometimes. So I grabbed the number and was going to hand it to her and she said, "Put it back." And I said, "Where? Like is there a rack around here?" And she said, "Put it back where you got it." What the heck? I had to put away my own clothes! Who even remembers where they grab the random shirt or shorts in a huge H&M store? So I thought that was kind of crazy haha. Every night we would go to the show after dinner. And here is Patrick playing on his iPhone probably playing Doodlejump. Any DoodleJumpers out there? Man that game is insane. Patrick made the high scores on the internet hahaha which means he has to play for like 3 hours straight and can only have 3 pauses in the game. Yes, we are freaks. But the shows were AWESOME! They had some dancers and singers and the dancers were okay...and the singers were good...but got old after awhile lol. i have LOVED browsing your vaca pics...what an amazing experience and it looks like non-stop fun! I also loved you, your sister and mom's clothes in all the pics too! Can you guys please start a fashion blog? I'd LOVE to subscribe to it! like a what I wore kinda thing...it would be awesome!